A bit of a last minute decision to run this race, but in the absence of a track session so far this week I thought a 3000 metre race would serve as an interesting alternative and being the last of this year's Dartford Harriers AC open competitions on home-turf made it irresistible. 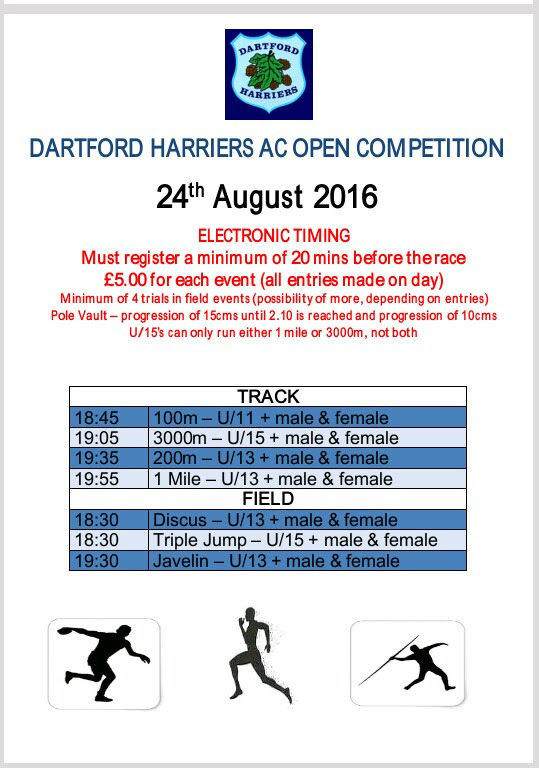 Entries to all track and field events were £5 and made on-the-night only. Before my race started I was able to catch a quick glimpse of some of the 100m races, which looked like fun but I was glad that I had chosen the longer race. The weather conditions were interesting. No noticeable wind but the temperature had been up to 30 degrees that day and the heat was quite intense. Still, once we got going I coped fairly well with it apart from my mouth feeling a little dry towards the end. With the 3000m start time set at 19:05 I headed around to the back straight of the track which is where the 7-and-half-lap race begins. 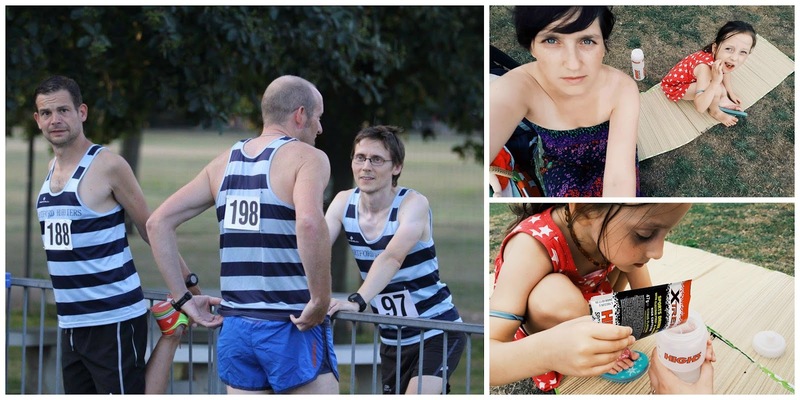 There were 14 runners in the race and I had already come up with a plan to try to attempt to run as even a race as possible. With that in mind, when the starter's pistol was fired I slotted in right at the back of the pack. I knew that it would be easy to get caught up in the faster pace that the majority of the field would be running at. I wanted to finish in under 12 minutes, which was too soft a target to aim for. I thought I'd be able to go faster but didn't want to use the go out (too) hard and (try to) hang on method. So my plan was to run the first couple of laps at around 12 minute pace 3k pace (1.36 per lap) and then gradually speed it up. Despite purposefully running at the back of the pack I completed the first lap in 1.28, which was a bit faster than planned but effort-wise it felt right. I stayed right at the back for the first 700 metres but then felt that I was being held back so I moved up a couple of places where there was some clear air and in the process spent a little to long out in lane 2. The runners at the front of the field were way off in the distance by now, but I just focussed on my own race. 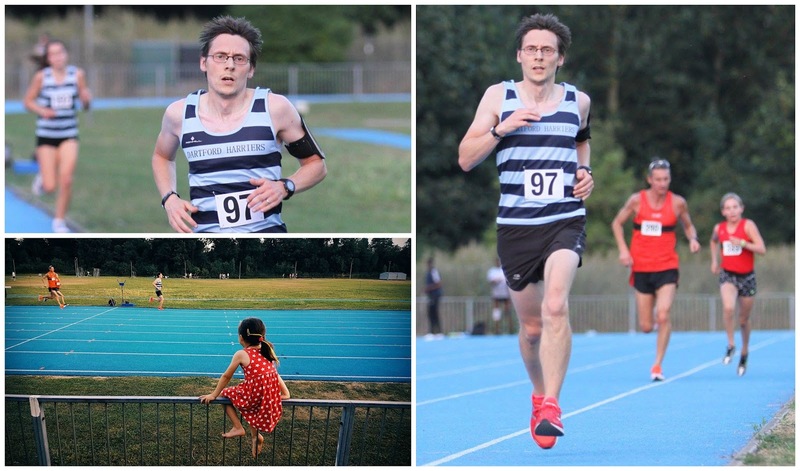 My pacing was going well and I certainly felt much better than at my only other previous 3000 metre track race where I really suffered during the latter stages. I felt much more in control of what was happening this time around and enjoyed it a lot more. I passed one more runner and was then on my own for the rest of the race, which I think ultimately may have lead to me relaxing a little too much and not pushing hard enough at the end. I really hate running with my phone on my arm and I was going to leave it off, but if I had I wouldn't have had my Strava GPS data to analyse after. I also ran with a Garmin but my current computer set-up isn't compatible with it so annoyingly I can't pull any data off of it (I'd like to change this soon). Before the race, I had looked up my previous 3000 metre track best time (11.26.8) and didn't think I'd get that close to it. However, I did manage to get close to it. In fact I was only .6 of a second away from equalling it, which in retrospect I probably could have done if I had had some competition over the last couple of laps. Or if I had just put more effort in during the last 200 metres, which I probably could have done if I had dug a little deeper. My kilometre splits worked out to be 3.51 / 3.49 / 3.47.